Great entrepreneurs can come from anywhere. 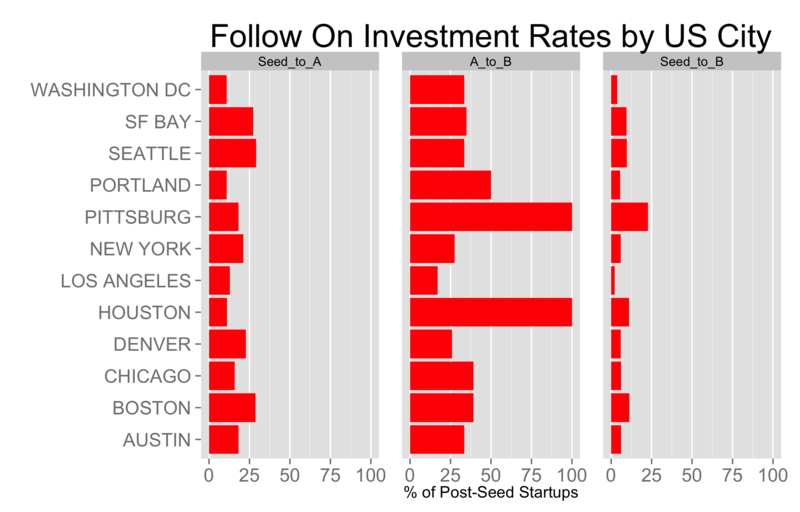 But do the locations of startups affect their ability to raise follow on capital? Do seed stage companies in the Bay Area face lower likelihoods of raising a Series A because of more competition? Or is it that New York based startups, because of a smaller ecosystem, face more difficulty? Using Crunchbase data, I charted the financing follow-on rates across the 12 US cities in which at least 10 seeds, 3 Series As and 3 Series Bs have occured in the Crunchbase data set from 2005-2014. The first two charts below contrast the success rates of post-seed startups raising an A having raised a seed and raising a B having raised an A. The third chart shows the success rates of raising a B having raised a seed round. A startup’s headquarters location seems to have no impact on the company’s ability to raise a Series A. Though there are variances between the low of Washington DC (11%) and the high of Seattle (29%), the differences aren’t statistically significant. In the Series B market, Pittburgh and Houston are two outliers where 100% of the recorded Series As raised Bs. Of course, the total number of companies in each case, is small, only 3. Setting aside those aberrations, again the differences between the markets aren’t statistically significant. These statistics don’t reveal any information about the difficulty of these follow-on rounds, or the terms of those rounds, or the time required to raise those rounds. But they do show the fund raising market is relatively efficient. Despite the concentrations of capital sources in places like Sand Hill Road and the Flat Iron District, investors are willing to board planes to seek out and underwrite investments in great companies, no matter where in the country they may be.